Mediatek is a name that might not ring a bell but it should. The Chinese chip maker’s roadmap has just leaked out and it shows a monstrous octa-core chip, the MT6592 coming by the end of the year. Why is that important? What if we told you that the MT6592 beats Snapdragon 800 in terms of both performance and power consumption. Right now, everything we have are preliminary AnTuTu benchmark scores, so it’s hard to say whether the test was performed on the same devices. If we assume so, though, the upcoming chip scores of 29 600 actually beat that of Snapdragon 800 based devices. The MT6592 is an octa-core Cortex A7 chip. The eight A7 cores run at up to 2GHz (in this test, up to 1.7GHz), but ARM is touting them as power-efficient ones as well so chances are Mediatek has done some optimization to keep power levels down. Compared to big.LITTLE setups with 4 Cortex A7s and 4 Cortex A15s, the new chip should definitely be more efficient in terms of energy consumption. Take a look at the screenshot below. Let us remind you that this chip will most likely be used by Chinese white box manufacturers making affordable yet powerful phones for under $300 off contract. Exciting, isn’t it? Looking foward to seeing all the chips compared. Still looking foward to the extra features that Snapdragon 800 is offering. Quick Charge 2.0. Support for GPS IZat GNSS. Also the always-on, low-power voice activation. I was surprised to hear the Moto X wasn't powered by the 800 since voice commands appear to be the main reason to get that phone. No AOSP support, no sale! Congrats to MediaTek for a useless chip, when everything except benchmarks are single-threaded! Congrats to TheLolGuy for a useless comment. Care to refute my point instead? Oh right, I guess your comment is just as useless, huh. Touche. Precisely. The newer versions of Android still have to account for lower spec'd phones, so it uses two cores. Now, the Play Store has almost one million apps, and how many do you think has a team of developer geniuses able to code parallel for two cores, let alone 8? The more cores you utilize the more of a nightmare it is to find the errors and fix them. So 95% of the time you're going to be sitting on 6 cores that would be collecting dust if not tightly sealed inside. This is nothing but to grab headlines, and as the Qualcomm CEO said before, the core wars are pointless. Android 4.3 is the start to put all those cores and more to good use. MediaTek is a Chinese company? Taiwan is the Republic of China. Big difference. China is mainand China or People's Republic of China. Taiwan is either an independent nation due to Japan giving up its rights after WWII (Japan had acquired Taiwan after the Sino-Japan War) or if you believe the Communist mainland Chinese, then Taiwan is a renegade province. Taiwan is known as the Republic of China. While the people of Taiwan are descents of the mainland, the ethnic Taiwanese is a separate and distinct race same as Americans and Native Americans, respectively. 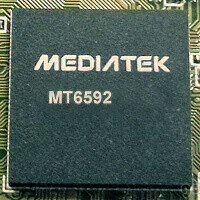 Mediatek is a Chinese company in a perjorative sense. I beleve they would like to call themselves a Taiwanese Company, instead. I just checked MediaTek's website for a company description. http://www.mediatek.com/_en/02_about-MTK/01_company.php Here's what they said: "Founded in 1997 and listed on Taiwan Stock Exchange under the code "2454", MediaTek is headquartered in Taiwan and has sales or research subsidiaries in Mainland China, Singapore, India, U.S., Japan, Korea, Denmark, England, Sweden and Dubai." Notice how they dodge the "Chinese" issue but make it clear that the Company is listed on the Taiwan Stock Exchange and has subsidiaries in Mainland China. Food for thought. Useless. For Android (or other mobile OS), most apps still don't take proper advantage of multiple cores. Most of them don't scale linearly with number of cores. Performance per core is much more important factor. How's the battery drain, though? And just because there A7's doesn't mean they'll be more effective than big.LITTLE. A7's have to work much harder to get the same performance has an A15, so just using a more effective architecture (and primitive) isn't going to make performance better (especially given performance on the A7 hits a wall that, even when over clocked, can't match the A15). Ah, Victor and his pearls again. Since when is snapdragon 800 below 29600 score? Its Antutu score goes up to 34000. Anyway, I'm calling the future ideal CPU setup for phones.. six A53 cores at 2.0Ghz and two A57's at 3Ghz with fully scalable core migration, done with 14nm process. Per core performance is where it's at. If you cared about per core performance you would buy intel. Maybe next mobile gen. But the Z2580 doesnt impress me. Good things coming though. You mean if the OS software is optimized? "Buttery smooth" sounds kind of... silly. Nope, they will be and are and smartphones are not really phones anymore either. I'd take a device with a Mediatek CPU.